Australia Day fly overs around the country. Today is Australia Day and one of the biggest days around the country to see aviation take to the skies. The first video is from the lead RAAF F/A-18A Hornet flown by the then solo display pilot “Bung”. Watch as he leads 2 other F/A-18 Hornets into Sydney Harbour and then pulls up into his solo display for the Sydney crowd. The footage was taken by a Gopro looking back at him. Next up is the footage from number two in the same formation and since he only got a quick lap around the harbour we have added some extra footage from the take off to the awesome low level flight along the coast line. This footage is in 360 mode so move the view and take in the view like you are in there with him. And to finish off the flight, here is the 360 video from the lead Hornet with the full display over the harbour. When: Thursday, 26 January 2017 12 noon. The Royal Australian Air Force will conduct a flypast and aerial display over the Sydney Opera House on Thursday 26 January 2017 at 12 noon in support of Australia Day activities. 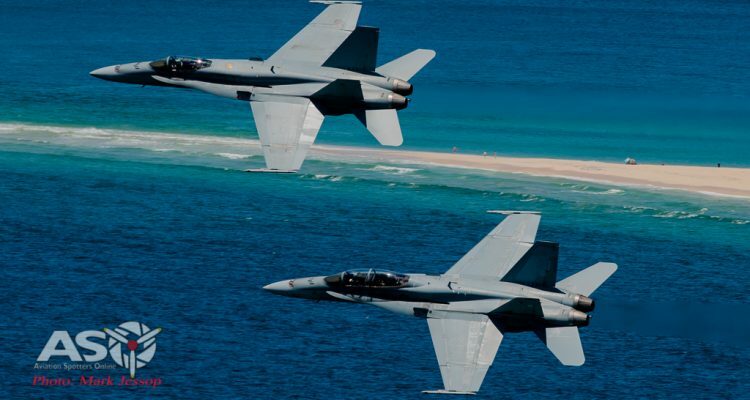 Up to three F/A-18A/B Hornet aircraft from Number 2 Operational Conversion Unit, based at Royal Australian Air Force Base Williamtown, will arrive from the east and carry out a ‘bomb burst’ manoeuvre before two aircraft depart to the east. A single F/A-18A/B Hornet will conduct a single-ship handling display over the Opera House then depart to the east. The aircraft will fly at speeds no faster than 740 kilometres per hour (400 knots) and no lower than 75 metres (250 feet) above ground level. Each flypast is subject to variables such as weather and air traffic control and maybe cancelled at short notice. Or how about some more 360 video footage of the flight back over Lake Macquarie and then down the Hunter River over Newcastle ? 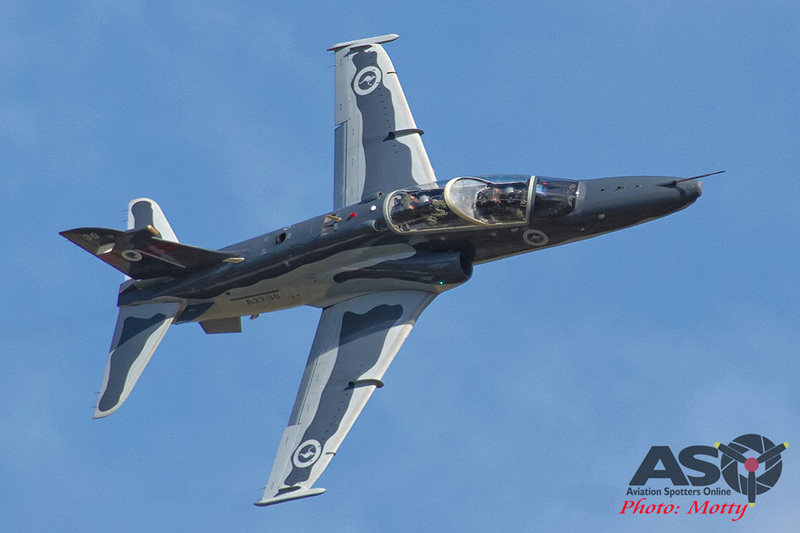 The Royal Australian Air Force (RAAF) will conduct a flypast and aerial display over parts of the Hunter region on Thursday 26 January 2017 from 12:15pm in support of Australia Day activities. 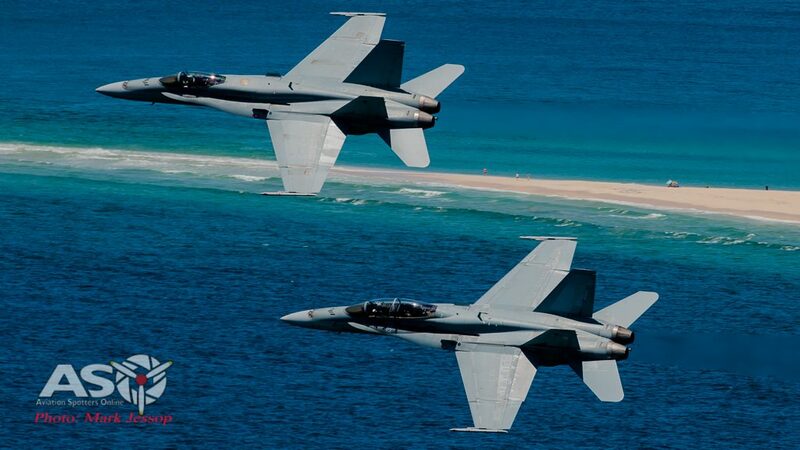 Up to three F/A-18A/B Hornet aircraft from Number 2 Operational Conversion Unit, based at RAAF Base Williamtown, will conduct a coastal flight over Newcastle at 12:15pm, Nelson Bay (Fly Point) at 12:20pm, Hawks Nest at 12.22pm and Raymond Terrace at 12:25pm. 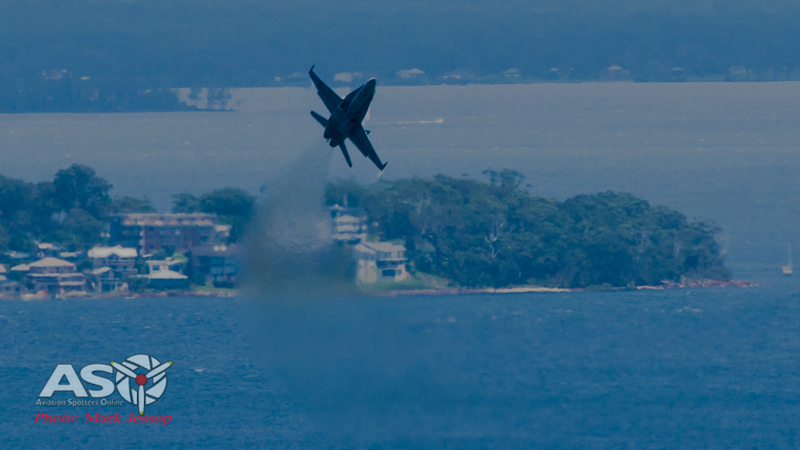 RAAF F/A-18 Hornet over Nelson Bay. The aircraft will fly at speeds no faster than 740 kilometres per hour (400 knots) and no lower than 75 metres (250 feet) above ground level. The Royal Australian Air Force will be conducting a flypast over the Australia Day Flag Raising Ceremony over Parliament House on Thursday 26 January, 2017 at approximately 10.24am in support of Australia Day activities. Up to three Hawk 127 Lead-In Fighter, from Number 76 Squadron based out of Royal Australian Air Force Base Williamtown, will complete a flyover of a number of significant Canberra locations at heights no lower than 150 metres above ground level and speeds no more than 830 kilometres per hour (km/hr). The aircraft will fly over Parliament House and the Australian War Memorial, tracking along Anzac Parade. The aircraft will then conduct a right-hand turn over Mount Ainslie to track north and east of Canberra Airfield to Queanbeyan; and then plan to track west, northwest overhead Lake Burley Griffin. The aircraft will refuel at Canberra Airport before departing back to Royal Australian Air Force Base Williamtown. The Royal Australian Air Force (RAAF) will be conducting a flypast of Adelaide City on Thursday 26 January 2017 at approximately 07.23pm in support of Australia Day activities. A single AP-3C Orion from Number 10 Squadron based out of RAAF Base Edinburgh will complete a flyover of Adelaide City (Elder Park) at a height of not below 250ft, at a speed of 300 knots, on a west to east direction. Footage from last years display over Canberra for Australia Day . The Royal Australian Air Force (RAAF) will be conducting several flypasts over the Melbourne region in support of Australia Day activities on Thursday, 26 January 2017. 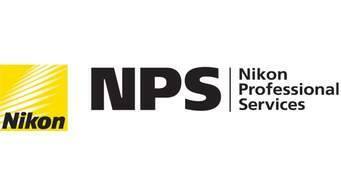 A low-level aerobatics display over Kings Domain Gardens in Melbourne will take place at approximately 12.30pm. Up to six aircraft from the Roulettes aerobatics team, based in East Sale, will take part in the display over Kings Domain Gardens, at a height as low as 80 metres. A low-level aerobatics display will also take place over Dandenong Park in Dandenong at approximately 4.30pm. The RAAF will also conduct two flypasts over the Melbourne Shrine from approximately 4.28pm. A formation of heritage CT-4A and Winjeel trainer aircraft from the Point Cook RAAF Museum will conduct the flypasts. The first flyover will be in a north-to-south direction; with the second taking place in an east-to-west direction. RAAF King Air over Townsville. The Royal Australian Air Force (RAAF) will be conducting a flypast over Townsville on Thursday 26 January 2017 at approximately 11.05am in support of Australia Day activities. Up to two King Air aircraft will approach Jezzine Barracks from the North West and will perform a flypast of Jezzine Barracks and The Strand. The aircraft will be at a height of approximately 150 meters. Number 38 Squadron operates the King Air from RAAF Base Townsville in Northern Queensland in a light utility transport role. Number 38 Squadron also participates in exercises and operations in the South Pacific region including deployments to Malaysia and New Caledonia in 2016. When: Thursday, 26 January 2017. The flypast is scheduled for 11am over Katherine and 12:05pm over Darwin. Where: Katherine and Darwin, Northern Territory. Flypasts by a Royal Australian Air Force (RAAF) C-17A Globemaster III transport aircraft will form part of the activities for Australia Day in Katherine and Darwin on Thursday January 26, 2017. 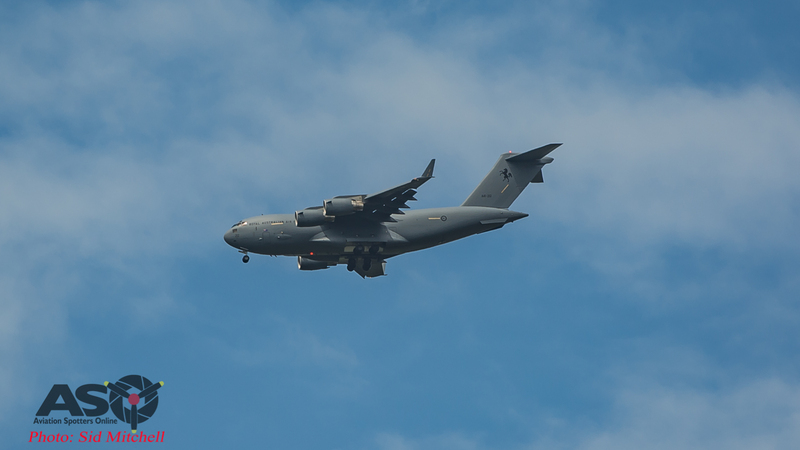 The Globemaster will approach Katherine from the South East and will overfly the Godinymayin Yijard Rivers Arts and Culture Centre at an altitude of about 90 metres. The flypast is scheduled to occur at 11am. The aircraft will approach Darwin from the North West over Fannie Bay and fly towards Darwin and the Esplanade, overflying the Cenotaph at an altitude of about 90 metres. The flypast is scheduled to occur at 12.05pm. Both flypasts are subject to variables that can include air traffic control and weather. This flypast may be subject to cancellation due to aircraft availability and operational requirements. The Royal Australian Air Force (RAAF) will be conducting several flypasts over the Perth region in support of Australia Day activities on Thursday, 26 January 2017. Up to four Pilatus PC-9 aircraft from Number 2 Flying Training School, based at RAAF Base Pearce will conduct a flyover at approximately 8.10am over Sir James Mitchell Park. The aircraft will travel in a north-to-south direction at a height as low as 80 metres. 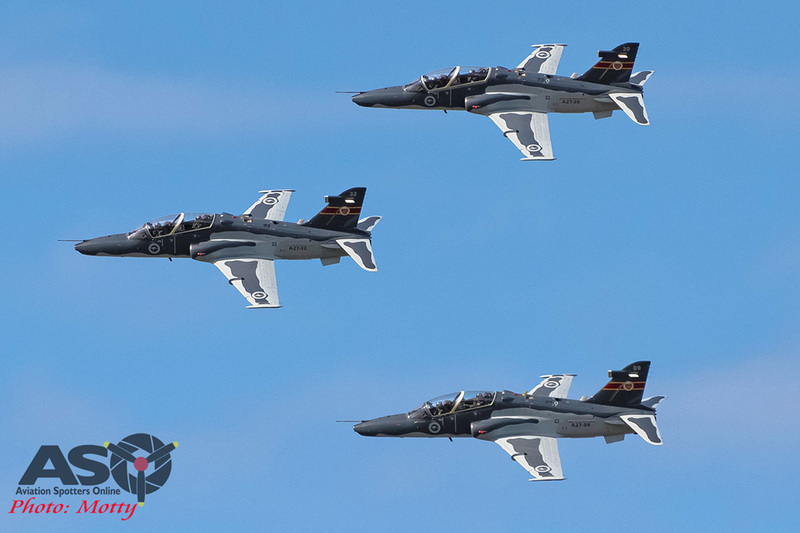 Up to three Hawk 127 Lead-In Fighter aircraft will also conduct four passes in close formation and an aerial display over Perth city as part of Australia Day Skyworks at 6.15pm. The aircraft will approach Perth city from the west, along Swan River, not below 310 metres over built up area; in a standard three-ship close and tactical formation. We hope everyone enjoys the day and a massive thank you to the Men and Women past and present that have helped all of us celebrate Australia Day .